‘ Excellent! 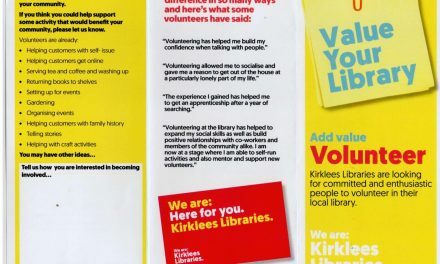 Very heartening!’ was the comment from Kirklees Library Services Area Manager, Alison Peaden to the positive response for Kirkheaton library volunteers. Fifteen residents turned up to a meeting held by the service at the Community Centre in September. 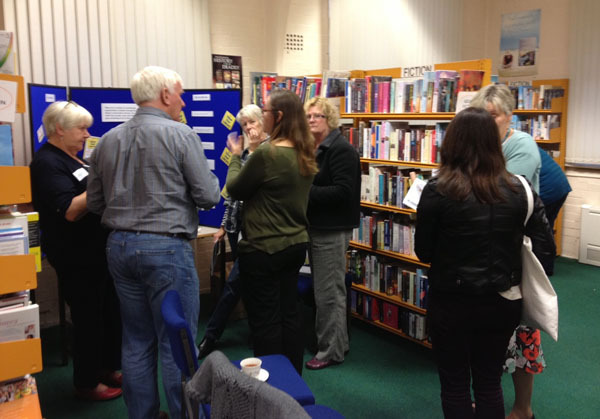 A number of others who were not able to attend have also registered their interest in becoming library volunteers. Various volunteering roles are on offer and it was stressed that commitment can be as little as a few hours a month. Training will be given. There are also exciting plans to expand the use of the library with events such as children’s storytime that has already started on Fridays at 2pm and the establishment of interest groups eg Local History, Reading Circle. Expected local budget cuts leave Kirklees libraries very vulnerable and it is felt that Kirkheaton Library needs to be in a position to continue if and when funding is withdrawn. So this is an exciting venture which promises to revitalise the service within the village. Interested in volunteering? It’s not too late – just pop into the library to see the displays and talk to one of the staff. PreviousHelp us grab a share of £25,000! Pop Up Cafe in safe,clean hands! YT’s Pop Up Cafe’s first session a great success!